AMPK Activator 991 is a novel AMPK activator, increasing AMPK activity of both AMPKgamma1- and AMPKgamma3-containing complexes in mouse skeletal muscle. 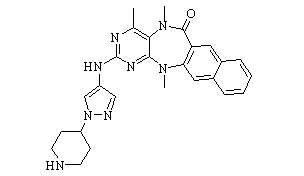 XMD-17-51 is a potent and selective NUAK1 inhibitor. MK-3903 is a potent and selective AMP-activated protein kinase (AMPK) activator with an EC50 of 8 nM. O-304 is a small molecule AMPK activator and PCSK9 modulator. AICAR is an activator of AMP-activated protein kinase (AMPK), down-regulates the insulin receptor expression in HepG2 cells. Dorsomorphin 2Hcl (Compound C; BML-275) has been shown to act as a potent and selective inhibitor of AMPK (AMP-activated protein kinase; Ki = 109 nM), induced by AICAR and metformin; also inhibits the bone morphogenetic protein type 1 receptors ACTR-I (ALK2), BMPR-IA (ALK3), and BMPR-IB (ALK 6). 6-Gingerol is an active compound isolated from Ginger (Zingiber officinale Rosc), exhibits a variety of biological activities including anticancer, anti-inflammation, and anti-oxidation. HTH-01-015 is a potent and selective inhibitor of NUAK1 with IC50 of 100 nM, does not significantly inhibit NUAK2 (IC50 of >10 μM).